Access to talent now ranks as a top priority for corporate executives, globally and in the Great Lakes Region, as sectors look to fill labor market gaps caused by an ageing population and a growing shortage of skilled laborers. Employment driven migration, as a result, is increasingly becoming a critical policy issue for government in countries like U.S. and Canada. 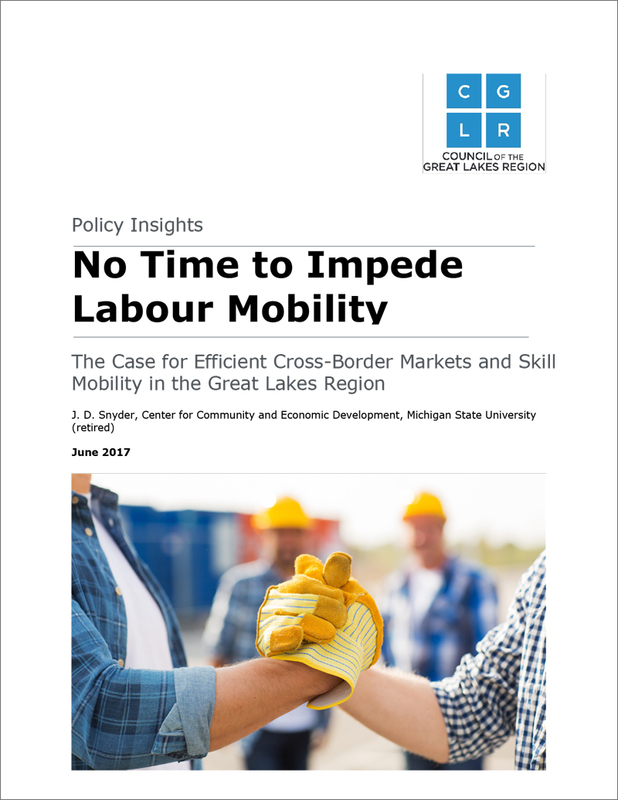 This report, entitled No Time to Impede – The Case for Efficient Cross-Border Markets and Skill Labour Mobility in the Great Lakes Region, lays out some key policy recommendations based on four core principles that will maintain a level playing field, including standardizing skills certification, protecting local labor markets, setting out rules and enforcement of employer conduct, and ensuring worker mobility across the border. The premise of globalization is to provide access to markets, capital, and technology to everyone and foster good governance. With good governance, it is believed, deficiencies that cause or sustain poverty can be dealt with and removed. Globalization brings about closer integration of nations and people with the breaking down of artificial barriers to the flows of goods, services, capital, technology, and to a lesser extent people. Advances in innovative information and communication technologies, as well as increased global connectivity through supply chains and value chains, have accelerated international trade exponentially under a framework of preferential bilateral and regional trade agreements, all of which have gradually reduced trade barriers and opened up a wide range of markets. The multilateral General Agreement on Tariffs and Trade that was incorporated into the establishment of the World Trade Organization (WTO) in 1995,1 has also been an important impetus for liberalizing the movement of goods and services. This framework of liberalized trade represents the third pillar in the economic system that was set up by the Allies in the Bretton Woods financial and monetary agreements in 1944 shortly before World War II ended. Bretton Woods established the International Monetary Fund (IMF) and the International Bank for Reconstruction and Development (World Bank) to stabilize the post-War economic world and support developing (then referred to as underdeveloped) countries in their economic development. But it took 50 years before the World Trade Organization was established.